I Love You More Than Carrots: Delicious Recipes, Great Pictures And More From This BoyMom! Delicious Recipes, Great Pictures And More From This BoyMom! Hi, I'm Erin. Mama to J. Wife to B. Full-time captive of the corporate world. I fancy myself a supermom, but most days I'm just human. My life is spent ignoring laundry, wrangling in a toddler and soaking up the fleeting moments of motherhood. I've found the community of my blog is the ideal place for sharing my story, documenting our days and finding the bliss in parenting. For now, we're settling nicely into our home at The View From 510. 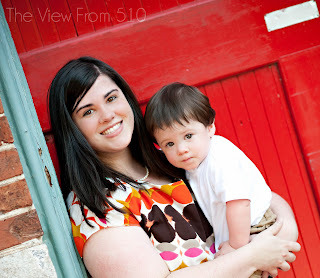 Be sure to follow along with Erin and her many adventures in mothering! One of my favorite bloggers meets up with another---nice!